Artist - Margaret Keelan's little patina style ballet dancers - beautiful! on a blog party hosted by Marsha Harris. We each share and post on one common theme. This month, our topic is PATINA! up a patina. I know you know what I mean? And, the beautiful 'patina' wrinkles that have recently arrived on my hands and face! Artist - Margaret Keelan little baby doll, my flowers against the walls in my studio. Patina happens slowly over time from just letting something soften and age naturally in the weather. the harsh sun and winter winds dry up the painted timbers, metals and old stonework. Patina is partially loved by collectors, decorators and designers and of course me! In our furniture workshop we would never ever remove the natural patina whilst restoring a piece of furniture. It is just like a painting, it is treasured and cared for and it is often the patina that makes the piece valuable to our clients as it holds so many memories. Furniture that is worn with age is now so protected ... which is quite ironic really as the patina was originally created from neglect. The base of a lovely old fire surround left in the weather - Artist - Margaret Keelan's little girl hold birds. Today I am thrilled to share the wonderful work of artist Margaret Keelan, whose doll like figures shown here next to the walls and aged items in my studio in the Southern Highlands. I couldn't think of anything else but Margaret's work when our subject of PATINA was decided. 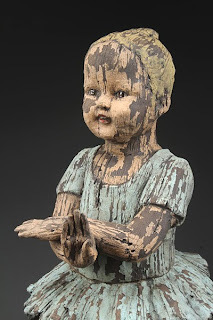 Margaret's beautiful PATINA style sculptures are a mix of "Santos" style figures mixed with 19th Century style doll heads, which have been sculptured from clay then glazed, stained, fired, then glazed, stained and fired again to create a wonderful weathered patina look. 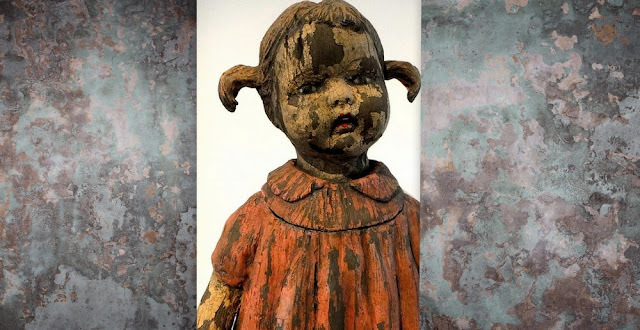 Her art is a perfect example of the beauty of patina in every way. The cracked and crazed worn paint, the softened colours, the split wood and the patina dirt that has built up in the little crevasses. This is definitely patina at it's prettiest! Artist - Margaret Keelan little girl and the patina walls in my studio. 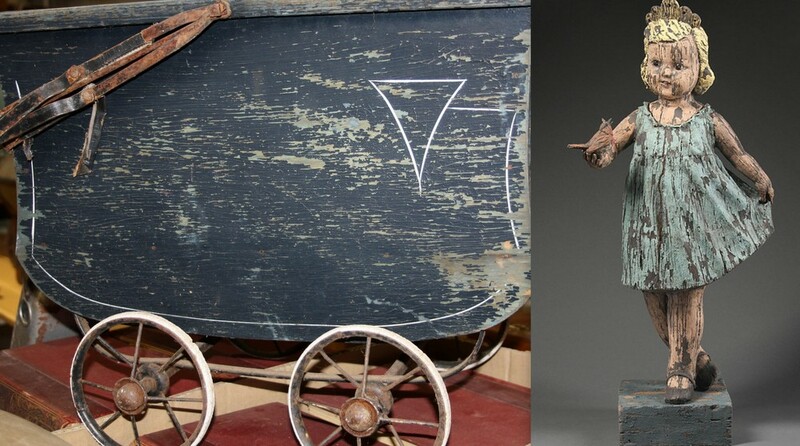 An old timber toy pram with lovely patina and Artist - Margaret Keelan little girl "Homage to Childhood Dreams"
Artist - Margaret Keelan's little girl and the walls in my studio. is absolutely fabulous. I love working and photographing in a very old part of my studio upstairs as the walls are old and mottled and the patina is perfect! time consuming to to paint. A few visitors have suggested that I paint the walls white! many of my photographs against these walls in Styling Magazine like this little rose petal lady below. The outside of our studio building, wonderful old patina walls. and some of the guests at the party today. CLICK TO READ ALL THE PAST ISSUES ... ENJOY AND SHARE! 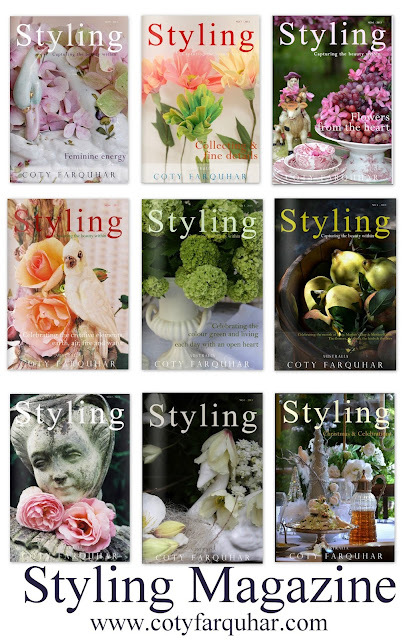 THE NEXT ISSUE OF STYLING WILL BE ON-LINE ON THE 12TH OF SEPTEMBER.